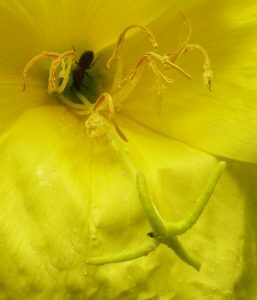 This week, I’m celebrating the Large-Flowered Evening Primrose, oenothera erythrosepala (Onagraceae), to give its formal name. 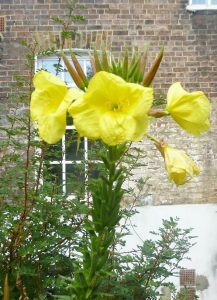 It’s a cousin of the smaller Common Evening Primrose, (O. biennis) but mine are larger. Once fully grown, they can easily top 6ft (well over 180 cms.). Looking down on my garden from my study window, June 26th, 2017. The evening primroses haven’t yet reached their full height. I was given the seeds many years ago by a much-loved aunt. 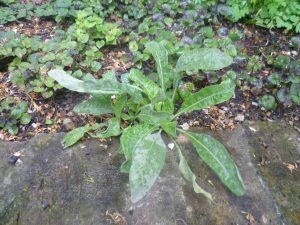 They are biennial and, in their first year, they look like weeds, just a circle of scrappy-looking lance-shaped leaves which often have a touch of mildew. It doesn’t seem to affect them and they give no hint of their future splendour. My garden is a small one with high walls, though I do get the morning and early afternoon sun, and I let my evening primroses put themselves where they will. This year I have nine of them, the most I’ve ever had. Next year, alas, I can see only one. Still, it looks as though it might have a double flower stem. What I love is that the flowers open within a couple of minutes just before sunset, their yellow petals revealing an almost-luminous disc of bright yellow which glows in the dark; and they fill the air with their scent. They attract night-flying moths but in the morning, bees and other insects feed off the nectar and you can see them burrowing deep into the flower’s centre before flying off, their legs covered in yellow pollen. Sadly, they weren’t doing this to order this morning when I went out to photograph them. Each flower lasts only one day and, by the morning, they are beginning to wilt and, within a couple of days, they will fall off, leaving the seed pods climbing up the stem which gradually swell, harden and go brown, then split open, producing thousands of tiny brown seeds. 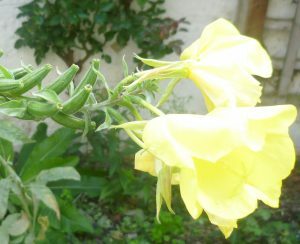 The flowers start blooming in May and, by late June, as the top picture shows, they are at their peak. Even now, there are still plenty of flowers to come and they will go on for a month or so yet. I let the seed pods dry naturally and gather the seeds in September/October. I don’t need to sow the seeds in the garden – they will have done that for themselves. Very beautiful they are too! I’m glad you like them, Elizabeth. I love sitting the garden at dusk and watching them come out. It’s magical. I used to have the shorter cousins of yours in my Montreal border and they too seemed to glow in the dusk. Lovely things. Thank you for your comment, Pauline. Your shorter ones sound rather better behaved! Mine tend to flop everywhere and get tangled up with other things. Beautiful. Do you have particularly green fingers, or are they genuinely easy to grow? Thank you for your comment, Prem. I assure you that my gardening skills are minimal! 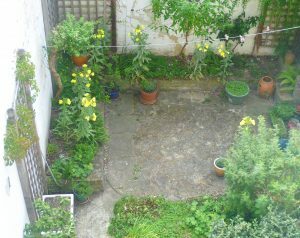 The evening primroses put themselves about and I let them get on with it – unless they try to come up through the paving stones. I never feed them, though, if we are having a dry spell, I do occasionally water them. I’ve seen them growing on very poor soil in Provence and they look perfectly happy. They do like sun, though. I’ve noticed that they never grow in the part of my garden which never gets any direct sunlight.